Earlier last week I discovered buckwheat noodles! As a self-proclaimed pasta addict, I was happy to find a pasta alternative that didn’t taste grainy or heavy. Also known as Soba noodles, buckwheat noodles are made entirely from buckwheat flour, making it gluten free. Rich with fiber and proteins this Chicken and Buckwheat Noodle Recipe keeps you full without feeling bloated. Boil noodles in salted water until tender. Set aside and remove as much water as possible. Repeat with broccoli. Season strips or chunks of chicken breast with salt and pepper to taste. Add olive oil to a hot pan. Once oil is hot, add the chicken breast and cook thoroughly. Remove the chicken and place in a separate container. To the same pan add 2 tbsp organic unsalted butter (or substitute) and proceed to add strips of red bell pepper, broccoli, ginger, soy sauce and lemon zest. You should have a creamy translucent sauce in your pan. Toss the buckwheat noodles in the sauce and veggies and add the cooked chicken. Serve warm and you’re done! What are some pasta alternatives you enjoy preparing at home? 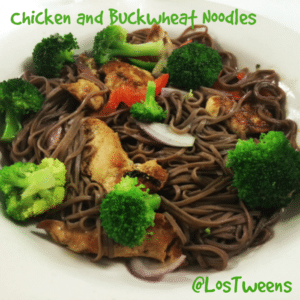 This entry was posted in Recipes and tagged Buckwheat, chicken, Chicken and Buckwheat Noodle Recipe, Gluten Free, Noodles, Pasta, recipe, Soba. Bookmark the permalink.